Classic Gaming Quarterly | Series Retrospective: Punch-Out!! “Mike Tyson’s Punch-Out! !” is easily one of the most recognized and beloved games on the NES console, overshadowing the three other games that were part of the franchise in the classic gaming era. Early 80’s arcade denizens will remember the original “Punch-Out! !” game, which was followed up by a lesser known sequel. The final game of the series in the classic era was “Super Punch-Out! !” for the Super Nintendo which, while an excellent game in its own right, never received the recognition of the NES release. In 2009 Nintendo released an updated version of Punch-Out!! for the Wii, bringing the greatness of the series to a new generation of fans. Each “Punch Out! !” game followed the career of a young boxer trying to fight his way past a variety of other pugilists in the World Video Boxing Association. Common to all of the games was the now familiar gameplay mechanics by which the player dodged or blocked punches usually portended by tells on the part of the opponent, such as a wiggling moustache, flashing eyes, or a shaking head. The player then returned fire after successfully dodging the blows of the opposing boxer. The player could defeat his opponent with either a “knock out” (KO), by which the opponent was knocked down and couldn’t get up within a 10 count or through a technical knock out (TKO), by which the opponent was knocked down 3 times in one round. If after the end of the allotted time the player had not defeated his opponent by one of these methods, he automatically lost which could be perceived as a loss by decision. The original “Punch-Out! !” was released as an arcade-only title by Nintendo in 1984. It featured the same third-person perspective as all subsequent games, but was distinguished from the more familiar home console versions by the fact that the main character was a green wire-framed figure through which the player saw the opponent, thus giving the arcade versions a somewhat lower camera angle than the latter releases. “Punch-Out! 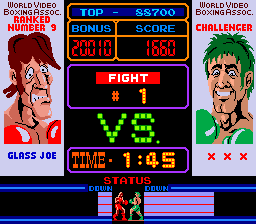 !” featured 6 opponents, 3 of whom (Glass Joe, Bald Bull, and Mr. Sandman) would later appear in the home NES release. It is interesting to note that no “Punch-Out! !” character appeared in all 4 games. The game consisted of one 3-minute round. If the player had not either KOed or TKOed his opponent within that three minutes then he lost. The player never actually won by “TKO”, but rather the opponent would simply stay down for the full 10-count on the third knock-down. If the player was able to defeat every opponent, then he would start again at the beginning. It was not possible to finish the game as the 6 opponents would repeat in order, becoming successively harder with each repeated matchup. The “Punch-Out! !” arcade cabinet was an upright machine made unique by its two stacked monitors. The actual gameplay occurred on the bottom screen, while the top screen displayed a picture of each fighter, the score, time, and fight number. Gameplay took place in a normal boxing ring in front of a large crowd. In the original game as well as its sequel, Mario, Luigi, Donkey Kong, and Donkey Kong Jr. are all visible in the audience. The control panel had three buttons; “left blow” and “right blow” buttons, and a larger “Hook / Uppercut” button which became available when the “KO” meter was filled. The “KO” meter filled in small steps with each hit scored. For every blocked hit, the meter would decrease by 1 increment, and for every hit landed by the opponent, the meter would decrease greatly. Scoring a hit with this special button did more damage to the opponent than a normal blow. Pressing up or down on the joystick caused the player to block high or low, while pressing left or right caused the player to dodge in that direction . Pressing down on the joystick while pressing one of the buttons caused the player to punch the opponent’s body instead of the head. In 1985 Nintendo released “Super Punch-Out” into the arcades as the follow-up to the successful original. It featured an all-new cast of 5 opponents, 2 of whom (Soda Popinski and Super Macho Man) would later appear in the home NES release. Gameplay was essentially identical to the original game, with the same third person view over and through the green wire frame player character. New to the game was the addition of a fourth “button” which allowed the player to duck. This was actually accomplished not with the addition of another button to the control panel, but by the use of a 5-way arcade stick that could be pulled slightly up and away from the panel. What really made “Super Punch-Out! !” stand out from its predecessor was the over-the-top style of the 5 opponents. Characters like Bear Hugger and Dragon Chan had much more distinctive styles than the fairly mundane characters in the original game. “Mike Tyson’s Punch-Out! !” was released for the Nintendo Entertainment System in 1987. It featured 11 fighters, 5 of which were new to the franchise. Reprising their roles from the arcade releases were Glass Joe, Great Tiger, Bald Bull, Vodka Drunkenski (renamed as “Soda Popinski”, presumably to be more child-appropriate), Mr. Sandman, and Super Macho Man. In this version of “Punch-Out! !” the player assumed the role of “Little Mac”, an undersized rookie boxer sporting familiar green shorts and gloves, who was trying to break into the WVBA along with his manager, “Doc”. The controls were slightly altered for the home release. There was only one way to block instead of high/low blocking, punches were by default thrown at the body so that the player had to press up and punch to aim at the head of the opponent, and the KO button only used one type of punch (the uppercut). The game also featured a password-based save game system. 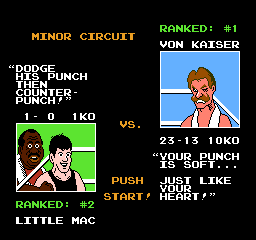 After every round in which Little Mac won a championship belt, the player was given a password allowing him to return to that point in the game in lieu of having to play through from the beginning every time. The same also featured numerous changes to the core gameplay. The single 3-minute round was replaced by three 3-minute rounds (although a gameplay minute was considerable shorter than an actual minute.) The KO meter was removed and instead the game used a system which awarded a star for certain hits landed on the opponent. For each star, the player could throw one uppercut. If the player was hit by the opponent, he would lose one star, and stars did not carry over between rounds. The game measured the player’s fatigue using a hear counter. With each bout the player started with 20 hearts. For each punch blocked by the opponent the player would lose one heart. When the player’s heart counter reached zero, the player would become too fatigued to throw a punch. Once he had dodged one of his opponent’s blows his heart counter would be restored. Unlike the arcade releases, it was possible to finish a game of “Mike Tyson’s Punch-Out!!”. After 13 fights (including 3 rematches), the player faced a final showdown with Mike Tyson. Winning this bout completed the game. “Mike Tyson’s Punch-Out! !” consistently shows up on NES best-of lists and is considered to be one of the best games on the system. No sequel to the game was ever released for the NES although a game was in development for a short time. 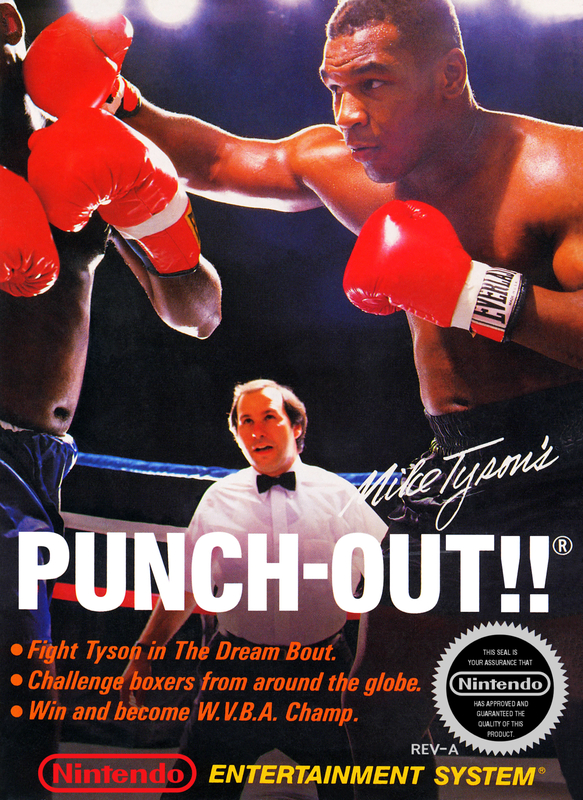 In 1990, the game was re-released simply as “Punch-Out! !” and Mike Tyson’s character and likeness changed to “Mr. Dream”, as Nintendo’s licensing agreement with Mr. Tyson had expired. In 1994, “Super Punch Out! !” was released on the Super Nintendo. Returning to the ring were series regulars such as Bald Bull, Mr. Sandman, and Super Macho Man. 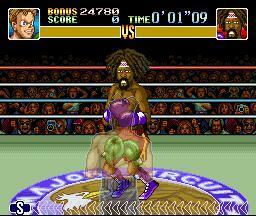 The game also featured several new characters, such as the seemingly Glass Joe-inspired “Gabby Jay” and Rastafarian music lover “Bob Charlie” (which surely only coincidentally rhymes with “Bob Marley”). With this release the game returned to its arcade roots, bringing back the single 3-minute round and the “KO” meter. Gone however was the green wire-framed boxer, replaced by a sleeker semi-transparent player model. The game had two modes; “Championship Mode” would be familiar to any “Punch-Out! !” veteran as the normal fight-your-way-to-the-top series of bouts. New to the series was “Time Trial” mode, in which the player would try to beat previously bested opponents with the fastest time possible. This new gameplay mode made it easier for players to practice against harder opponents instead of having to play through the game to reach them. The game’s controls more closely resembled the arcade versions than the NES release. The player could once again block high and low as well as dodge to the side and duck, and punches to the face were the default. “Super Punch-Out! !” added one additional special move which could be executed once the “KO” meter was full. 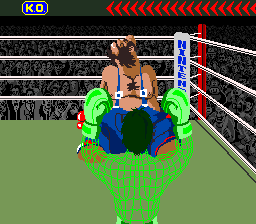 On top of the normal hook and uppercut, the player could unleash a rapid barrage of punches at either the head or torso of the opponent. Overall, Nintendo was able to distill the best attributes of all three previous releases and focus them into the final game in the series. “Super Punch-Out” was the culmination of 10 years of development, and is quite possibly the best arcade-style boxing game every created. Even 15 years after the release of the final game in the series, “Punch-Out” is still the premiere franchise in the arcade boxing genre. 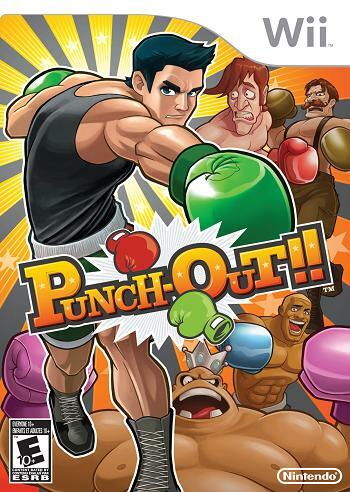 Update: In May of 2009, Nintendo released Punch-Out!! for the Wii. The game maintains the feel of the original console games, while bringing a little bit of new to the series. There are 4 new opponent boxers to fight against along with a multitude of boxers from previous installments in the series. Punch-Out!! on the Wii also gives you a few control schemes to choose from. The first (and my preference) simply uses the Wii Remote turned sideways in a NES style. You can also use the Wii-Mote and nunchuk together, or you can get crazy and bust out a Wii Fit balance board. These schemes are a little too nutty for me however, which is why I stick with the classic mode. The game also introduces a multi-player mode for the first time in the series, allowing you to battle a friend (you will both be Little Mac) in split-screen mode. This really does nothing for me, as it lacks that which makes the series great – the colorful opponents and unique gameplay. That being said, this game is a must-buy for any Wii or Wii-U owner (the game is downloadable on the Wii-U Virtual Console) who is also a fan of the Punch-Out!! series. Tagged Arcade, NES, Nintendo, Punch Out, SNES, Super Nintendo, Wii. Bookmark the permalink.